Al-Quran and As-Sunnah are the two everlasting legacies left by Prophet Muhammad s.a.w. in providing the eternal guidance to humanity. Through the study of the Al-Quran, students will be introduced on ways to appreciate the specialty of Al-Quran – the sacred words of Allah that are well preserved today and acknowledge the importance of As-Sunnah as the foundation of Islamic knowledge. This module will cover the special position of Al-Quran as the enduring miracle of our beloved Rasulullah s.a.w and bring attention to understand critical understanding of the historical phases of the Quranic revelation and its compilation. Through the study of his As-Sunnah, students will be introduced to important terminologies in the categorization of Hadith literatures and study the various historical phases in the process of Hadith compilations. In this course, students will be expected to self-reflect their relations with Al-Quran and As-Sunnah and aimed to familiarize them with these two living sources in enabling them to appreciate the importance of the foundational sources of Islam. For those who wish to understand Al-Quran and As-Sunnah, be it refreshing or without knowledge of it. Suitable for 18 years and above. 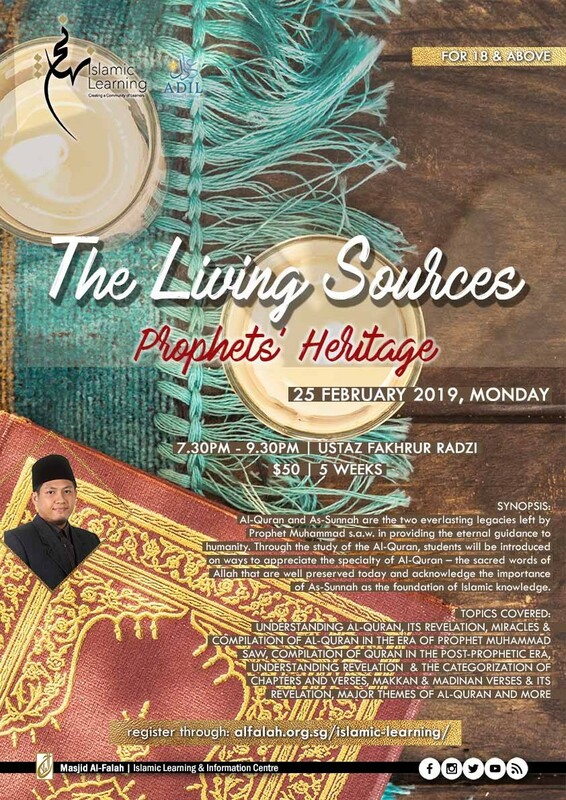 The class will commence on 25 February 2019, Monday from 7:30pm to 9:30pm and will be conducted by Ustaz Fakhrur Radzi. The class will be in English. Register now at http://alfalah.org.sg/islamic-learning/ for only $50!